Bethany Chapel in Calgary offers a wide variety of services for the larger community they belong to including: ESL classes, a ladies Bible study with childcare, a homework club, a licensed playschool for 3 and 4 year olds, low-cost used clothing, and fresh fruit and vegetable boxes. Community Development Pastor Heather Webber, who was hired in 2000, provides oversight to these ministries and helps the congregation continue to be intentional about reaching out. New Canadians like Sarra Lual benefit from these programs. “We were here in Calgary for about a year when my husband first saw a flyer inviting people to the toy lending library and ESL at Bethany Chapel,” says Sara. At first Sarra thought she was coming to a community centre. She was pleased to find out it was a church. 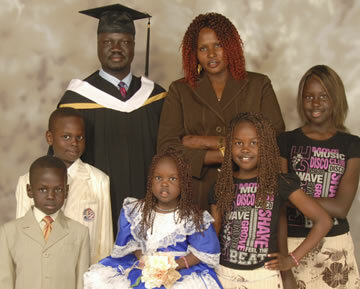 Sara grew up in a Christian family in South Sudan. Her mom was a deaconess in the church in her village. An uncle taught Sarra songs and stories from the Bible that helped her learn about God’s love. She made a commitment to Christ at the age of 15. After marrying, Sarra fled with her husband to Ethiopia to escape the war in Sudan. Then in 2000, the couple came to Calgary. “I started coming to ESL, ladies Bible study, when I could, and my younger children came to the playschool,” says Sarra. At first Sarra did not go to services because she did not understand English well enough. As her language skills improved, she began attending Bethany. “I now have five children who come to Sunday school, the youth program, and they also have come to VBS and go to camp in the summer.” Two of Sara’s children belong to the church choir. For a few years Sarra worked as a housekeeper at Mount Royal University. But now that her husband has gone back to Sudan to look for a job, Sarra stays home with her children. Sarra is connected with some of the other African families at Bethany as well as many of the Canadian families. She is thankful for her church family and their support. Sarra was baptized at Bethany in January 2013. Choose from Seven Keys of Celebrate Recovery or the Advanced Leadership Training track. Celebrate Recovery is a Christ-centred program to help people overcome hurts, hang-ups, and habits.